The hedgehog is one of those animals that seems to belong in the British countryside by ancient right. They are embedded symbolically and sentimentally in our culture, and it is easy to see why they remain popular. In evolutionary terms, the world’s spiny hedgehogs have changed little in the last 15 million years. If you think of that as a day, modern man appeared about 10 minutes ago, agriculture less than a minute ago, and the last 100 years occupied the last half-second. Given that the hedgehog ‘formula’ developed in a world radically different from that of today, it is astonishing that they persist at all. Nevertheless, within living memory hedgehogs have been – and in some parts of Britain remain – a very successful species. For instance, a study in north Norfolk in 2008 found a density there of more than 40 per 100 hectares. Hedgehogs are a component of the farmed landscape that the GWCT has scarcely considered before, but ecologically they are at the heart of ‘hot’ countryside issues. The invertebrate creatures that form the bulk of their diet are affected by the intensity of modern agriculture, making an obvious parallel with farmland birds. Agri-environment schemes to mitigate this impact potentially benefit hedgehogs just as they do farmland birds; and indeed hedgehogs have been shown to favour grassy field margins in an otherwise intensive arable landscape. But dead hedgehogs cannot benefit, and there is known to be a strong negative relationship between badger density and hedgehog density; foxes, too, can learn to kill hedgehogs. Then again, hedgehogs are predators themselves. Predation by hedgehogs on the eggs of ground-nesting wading birds is the reason they are being removed systematically from the Outer Hebrides (where they are not native) and transferred to the mainland. When hedgehogs were more common on the mainland, they were killed on shooting estates as predators of wild gamebird eggs, and thus were routinely recorded in National Gamebag Census data. Both the number of estates recording hedgehog catches and the numbers reported have fallen dramatically since the early 1960s. The Wildlife & Countryside Act 1981 ruled that hedgehogs may not be deliberately trapped, though unless measures are taken to exclude them they can still occur as a by-catch in tunnel traps. Regrettably, we cannot distinguish to what extent the trend in NGC records indicates a declining hedgehog population, lower trapping effort, more focused trapping, unwillingness to record hedgehog captures, or all of these effects. There is nevertheless a widespread perception that there has been a decline in UK hedgehog numbers in recent decades. As with many other mammal species, there is no routine surveillance system, and no established method to determine distribution or population trends. There have been questionnaire surveys, and systematic recording of road kills. The People’s Trust for Endangered Species has mapped hedgehog distribution through questionnaire surveys to householders. This has told us a lot about the national distribution of hedgehogs in gardens, but inevitably it also reflects the distribution of people in Britain. Trends in the number of hedgehogs killed on roads are complicated by traffic density and speed and by shifts in recorder enthusiasm. In either approach, the 70% of Britain’s land area that is agricultural is essentially unsurveyed. 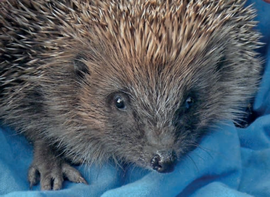 The Nottingham Trent University, in partnership with the Mammal Society, has researched the use of simple ink-and-paper tunnels to detect the presence of hedgehogs by recording their footprints. This provides a cheap tool to help determine hedgehog distribution, and potentially an index of abundance too. So hedgehogs present themselves as a component of the farmed environment in which the GWCT should take an interest. As opportunity and resources allow, we have made the decision to do that. 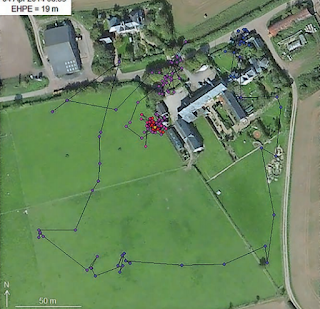 We believe that we have something to offer, both in further developing the detection methodology (much as we did in the context of mink control), and in establishing what is happening to hedgehogs in the farmland landscape. Is there a decline? And if so, is the cause a shortage of invertebrate food, or predation, or something else? Why do hedgehogs appear to favour gardens, even in the middle of farmland (see Figure 1)? How can we best manage farmland so as to achieve the most satisfactory balance between all our native species?